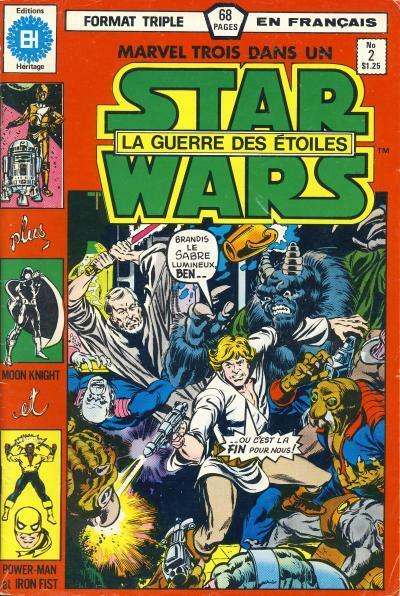 The Marvel Illustrated Books Star Wars was published in France by Dynamisme Presse Edition in 1981 as La Guerre Des Etoiles. The paperback is the same size as the U.S. paperback. The front and back covers have the same art as the U.S. edition. 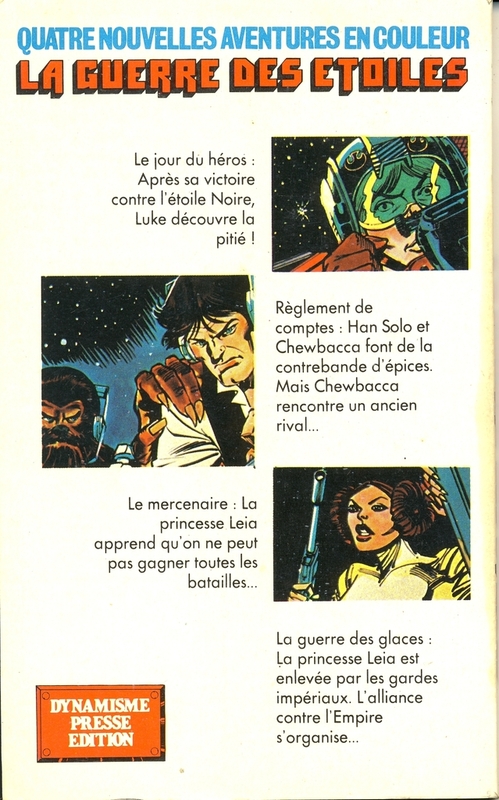 The coloring on the French edition is noticeably darker and the Princess Leia scene is now colored instead of using just the line art from the U.S. edition. 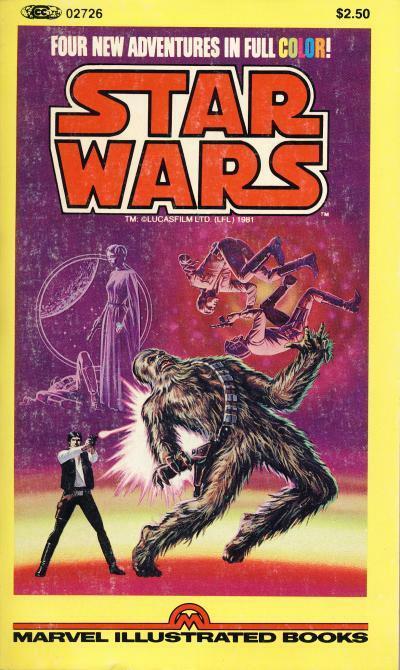 The second U.S. paperback publishing original British Star Wars Weekly content for the U.S. came out a year after the first paperback. 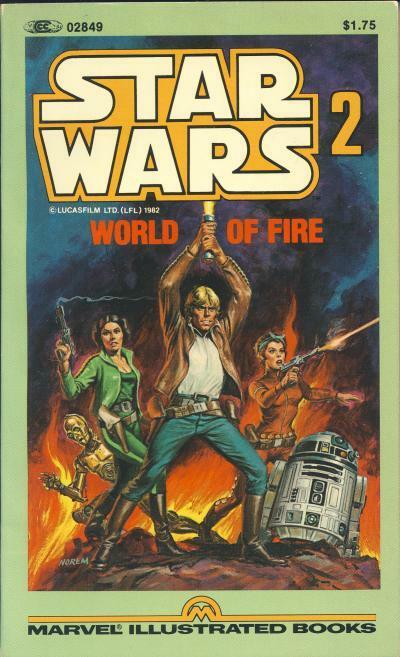 This paperback contains the single story World of Fire from Star Wars Weekly #107 - 115. The cover contains a painted picture of Luke Skywalker, Princess Leia, C-3PO, R2-D2, and Mici Shabandar. This is one of the few times Luke Skywalker and Princess Leia are wearing clothes different than their attire from the Star Wars movie. The outfits could have been from the movies and its too bad Marvel didn't allow the characters to change their clothes more often in the comics leading up to The Empire Strikes Back. On the cover, R2-D2 is his usual comic book "bulky" self (a depiction that Carmine Infantino used throughout his run on the Star Wars title) but C-3PO is looking excessively thin. 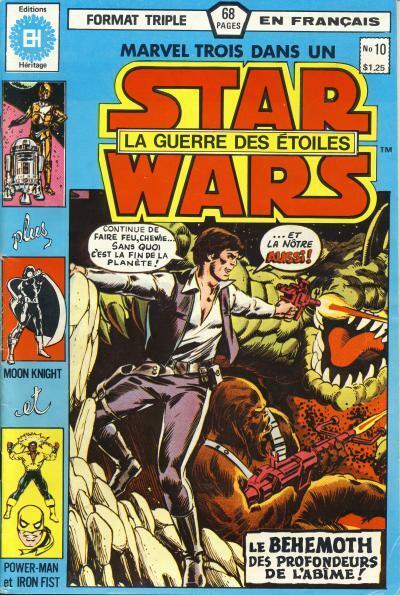 The British Star Wars Weekly published new Star Wars comic content when it ran out of U.S. material to publish. Some of that original Star Wars Weekly material was published for the U.S. in the form of two paperbacks. The first paperback published original Star Wars Weekly content including the conclusion of the Pizzazz story The Kingdom of Ice from Star Wars Weekly #60. 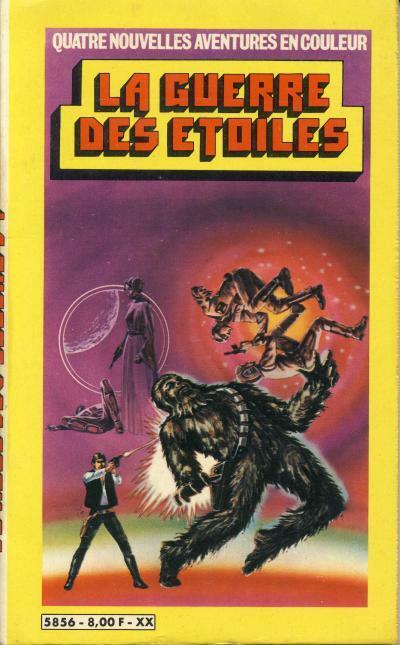 This paperback contains: Way of the Wookiee from Star Wars Weekly #94 - 96, The Day After the Death Star from Star Wars Weekly #97 - 99, The Weapons Master! from Star Wars Weekly #104 - 106, and the conclusion of The Kingdom of Ice from Star Wars Weekly #60. The cover contains a montage of the first 3 stories from the paperback, including a cool drawing of Han Solo shooting Chewbacca in the back. DC Comics launched the After Watchmen: What's Next? promotion in 2009 to coincide with the release of the Watchmen movie. The promotion included reprints of single comics that were priced at just $1. These inexpensive reprints were used to drive sales of the trade paperbacks for these comics. The idea is a reader would pick up the reprint for $1 and if they wanted to read more, they would need to buy the trade paperback. Marvel Comics followed with the similar Marvel's Greatest Comics promotion which included reprints of #1 issues which were also priced at $1. Marvel's promotion was timed for release with Free Comic Book Day in May 2010. Also for Free Comic Book Day in May 2010, Image Comics published Image Firsts which also reprinted #1 issues at the same low price of $1. Dark Horse Comics followed later in 2010 with their own version of this promotion with the One for One line of reprint comics. 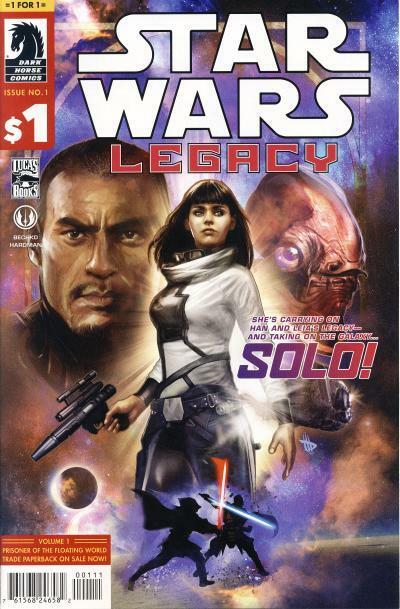 In 2010, they released the One for One - Star Wars: Legacy. 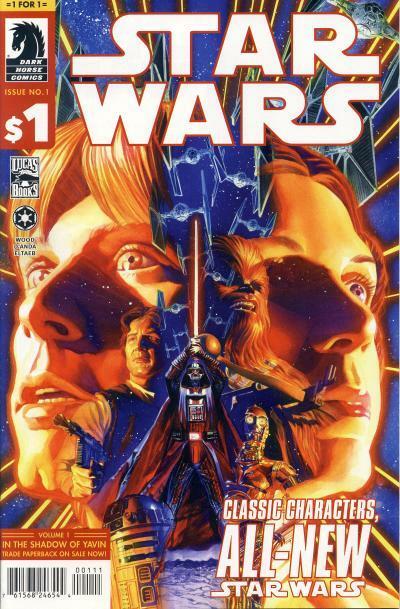 These promotion which offer a single comic for $1 have been successful; Dark Horse released more reprints over the years in this line, including 2 more Star Wars issues. Marvel is using this tactic again this year with the True Believers promotion. This promotion will be used to introduce readers to Marvel's female led titles, including the Princess Leia mini-series that will be collected in a trade paperback in August 2015. True Believer: Princess Leia #1 will be priced at $1 and goes on sale in September 2015. As a comic collector for over 35 years, one of the most fascinating aspects of collecting has been how easy it is today to purchase domestic back issue comics. Prior to the Internet, you had your local comic shops and mail order companies and if they did not have a particular comic you wanted, you most likely went without the comic unless you put in the extra effort. Regardless of how deep your pockets were, there were comics that simply were not available for purchase and a collector would have to scour yard sales and antique shops, peruse back issue catalogs, and network to build a collection. Because of the limited choices for purchasing comics, there was an aspect to collecting comics that is largely missing today, the thrill of the hunt. Some of today's collectors emulate that thrill by seeking out ultra high grade books for many of the populous books from the Silver, Bronze, and Copper Ages. Unfortunately, that thrill is also accompanied by higher prices. There are still areas of comic collecting that are reminiscent of the old days that provide the thrill of hunting for comics. There are comics published in the Golden Age and earlier that are certainly hard to find. And even in the Silver, Bronze, and Copper Ages there are certain genres that are not as populous as the superhero genre, such as western and romance books. Additionally, many independent publishers had smaller print runs that can prove to be elusive for collectors seeking out those esoteric titles. Another area of comic collecting that provides the thrill of hunting is foreign comic books. My interest in this area is based in large part on that thrill of seeking out comics that are hard to find. I know that if I want any domestic Star Wars comics, even the expensive Star Wars $0.35 editions, it is simply a matter of having the money. This is different for foreign Star Wars comics, but I have to admit this area is slowly changing. 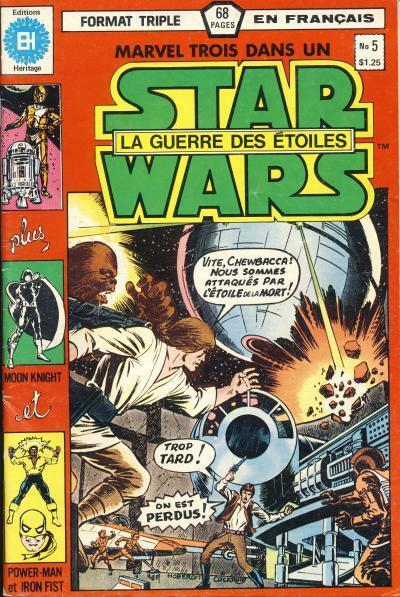 A few years ago, it was uncommon for foreign Star Wars comics to show up on eBay. But as more countries are being introduced to this powerful online selling tool, more and more foreign comics are being listed. 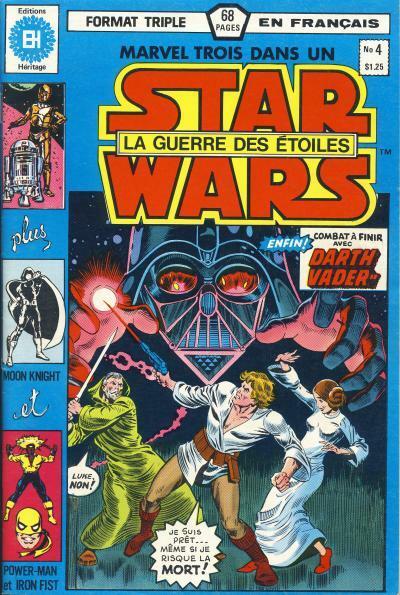 As an example, it use to be impossible to find vintage Yugoslavian Star Wars comics, but in the past 6 months, many Yugoslavian Star Wars comics have been listed on eBay. 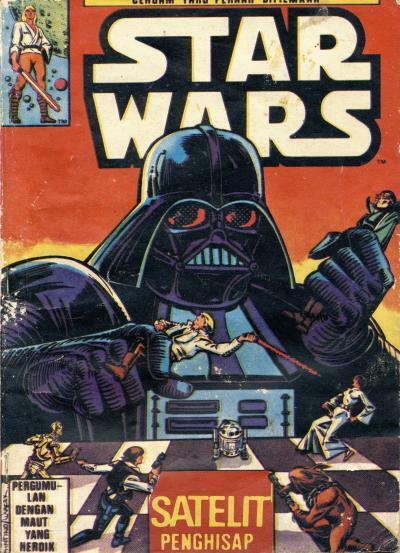 It is too early to tell if these Yugoslavian Star Wars comics are going to become a staple on the eBay site or if we are just incredibly lucky so many issues have found there way to the site recently. 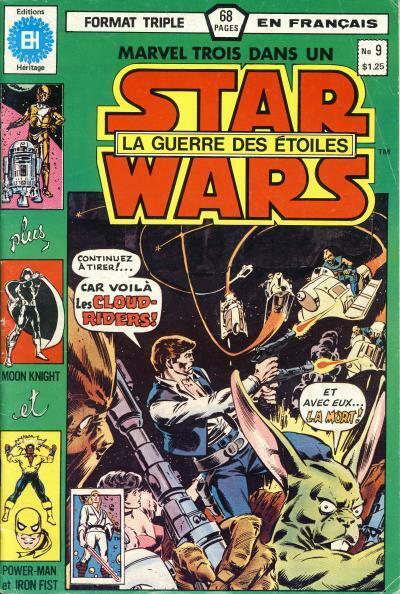 (If you collected Star Wars comics for a while now and used eBay as a tool for seeking out Star Wars comics for your collection, you might remember a few years ago when Israeli Star Wars comics were consistently listed. That no longer seems to be the case.) This has also been true of vintage German, British, and French Star Wars comics which now do seem to be consistently listed. As more countries are introduced to global online sales sites like eBay, I have no doubts it will become easier to find books from some of the harder locations in the world, namely Asia and South America. But, that is not to say all foreign comics are going to be as readily available as domestic superhero comics are. Certainly, comics from Western countries with high populations are going to be the easiest to find, just as they are today. 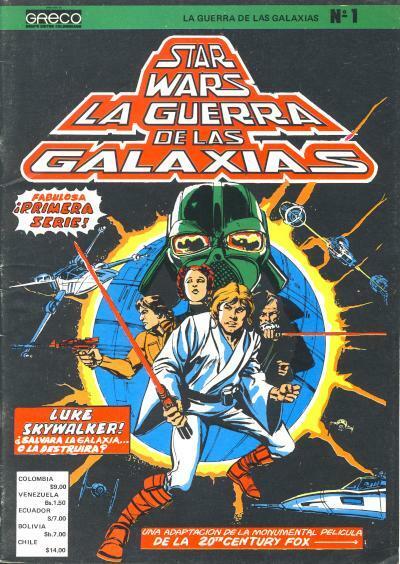 It is not an accident that Rebelscum's International Star Wars comic galleries shows comics from many of these countries, but doesn't contain galleries from many of the South American or Asian countries. There are still going to be countries like Greece, Indonesia, and even Mexico where the population of comics is going to remain elusively low. Navigating this shrinking world is going to be interesting. As more foreign comics are made available, unless you have deep pockets, choices are going to need to be made on where to spend your dollars for your collection. In my case, do I spend the money on the more available European Star Wars comics I want or do I purchase the elusive Asian Star Wars comics? Luckily, I have the means to pursue both at this point, but I know there will come a day where I will have to make a choice just as I made the choice to limit my collection to predominantly Star Wars comics. 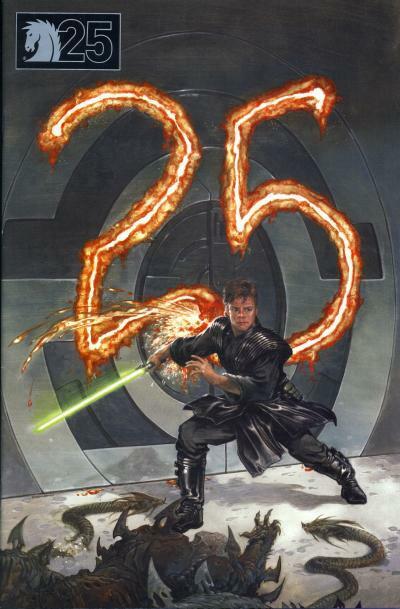 In 2011, Dark Horse Comics celebrated its 25th anniversary by releasing 12 comics that year with special 25th anniversary covers. This promotion started in January and one comic a month had a special cover solicited with a 1 in 10 ratio. One does not need to look further than this promotion to understand how important the Star Wars line of comics had been to Dark Horse; 3 of the 12 comics that participated in this promotion were Star Wars comics, including the first of the 25th anniversary covers. These issues typically fetch $10 in NM condition on eBay. Princess Leia did not ship in May which explains it's absence from the charts. Star Wars #5 was only topped by the 1st two issues of Marvel's summer crossover Secret Wars and the 1/2 million Loot Crate sales of Bravest Warriors Tales from Holo Jones #1. 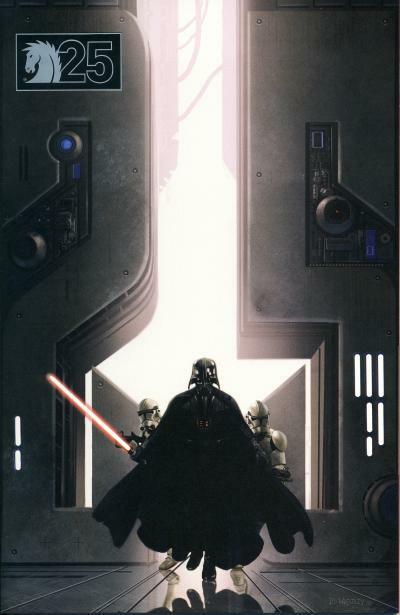 Darth Vader #5 was topped by those same issues plus 3 additional Secret Wars tie ins. 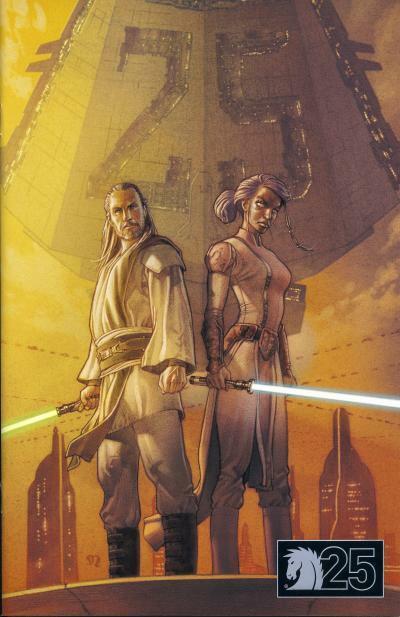 Slightly disappointing are the sales of Kanan: The Last Padawan #2. This title does not have ties to the original trilogy characters, but it does tie into the popular Disney XD television series Star Wars Rebels. It is too early to know if sales of Kanan: The Last Padawan will continue to drop or if they will stabilize above cancellation numbers, but it is clear that comic audiences have not embraced this character as much as they have the original trilogy characters. Dark Horse had similar problems (relatively) with the Star Wars: The Clone Wars series that was released when the popular Cartoon Network television series was on. 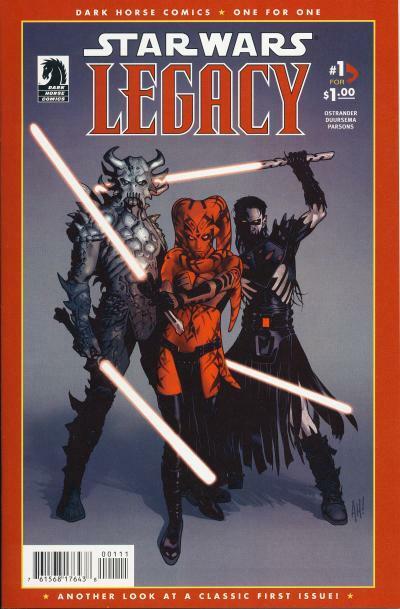 That series only ran for 12 issues before it was canceled due to low sales. I feel a Star Wars Rebels comic would do better since there are other characters on the Ghost that are more popular than Kanan, but Marvel may have their hands tied while the series is running. The Star Wars Episode IV New Hope hardcover placed 16th on the trade paperback list with an estimated 3,643 sales. 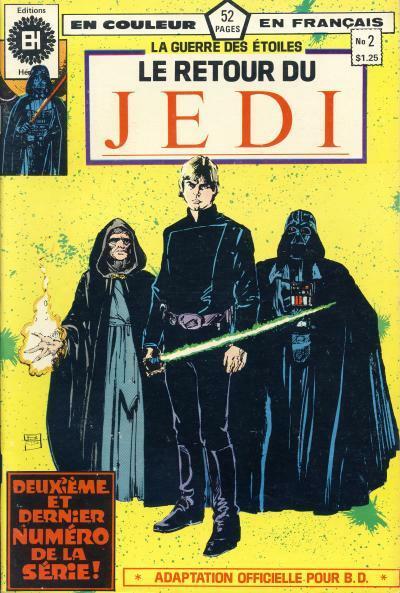 This was the hardcover that represented the original Marvel Star Wars adaptation but with modern coloring. Please read the blog posting May 2015 comic sales estimates online: Loot Crate effect hits half-million copies. Marvel Comic's had a strong month with the start of the Secret Wars crossover. Only 2 Star Wars titles placed in the top 10 for the month of May; Star Wars #5 placed at 4th and Darth Vader #5 placed at 8th. We will have to wait until next week to see where Princess Leia and Kanan: The Last Padawan placed. Here are four more Indonesian comics published by Yayasan Karya Bhakti Bandung. These are digest-sized, black and white comics with the lead story being Star Wars and another non-Star Wars back up story. 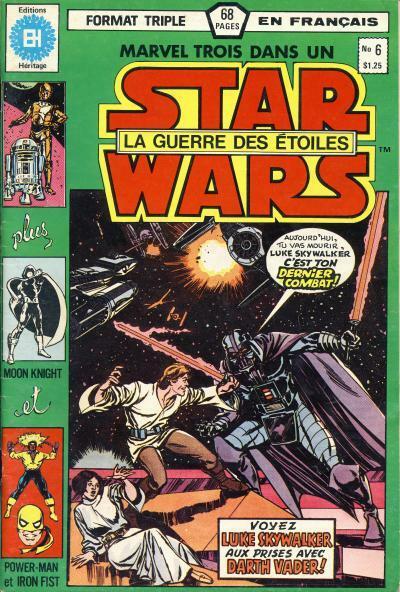 Both comics contain an original Star Wars story. The stories feature Darth Vader, Luke Skywalker, Han Solo, Princess Leia, and Chewbacca. 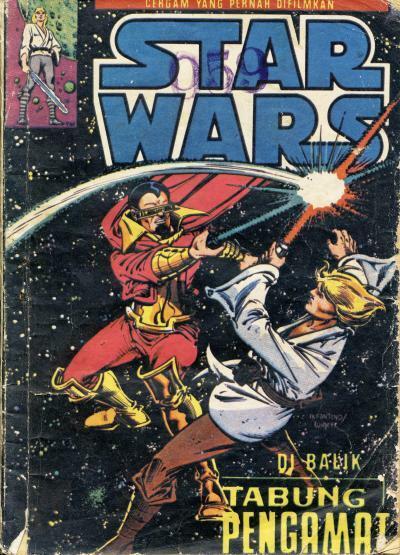 The cover for this first issue is from Marvel Comics Star Wars #4. This issue is titled Robot Perampok Uranium or Robot Robbers Uranium. The cover for this second issue is from Star Wars #5. This issue is titled Planet Merah or Red Planet. The cover for this next issue is from Star Wars #33. This issue is titled Di Balik Tabung Pengamat or Behind the Observer Tube. the cover for this final issue is from Star Wars #35. This issue is titled Satelit Penghisap or Satellite MacGregor. The art is similar to art found in many independent U.S. comics from this time period. In an earlier blog in this Indonesian series, I mentioned that I thought these Miranatha issues were licensed comics. That was before I knew they contained original art and stories. Now that I'm seeing more of these issues, I think it is safe to say none of these Miranatha digest-sized comics from the 1980s are licensed, including those that are Indonesian editions of Marvel Star Wars comics. 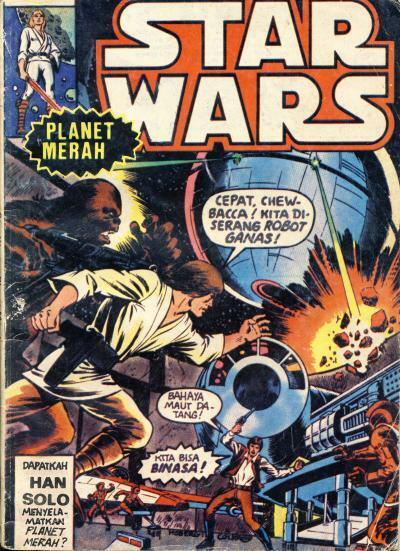 Since I posted the blog concerning the Indonesian Star Wars comics by Jan Mintaraga, I have acquired issue #2. I have update the blog to contain the picture of the cover. 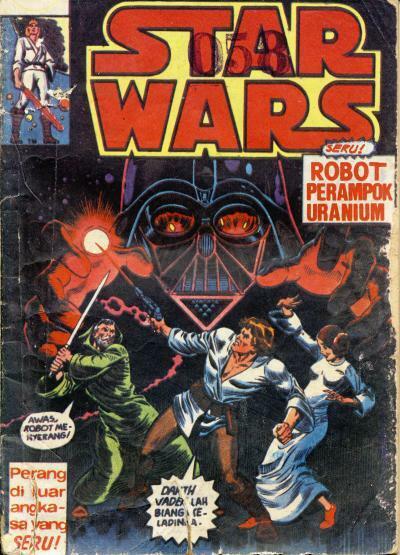 Click on Retro Foreign: Indonesian Star Wars (Part 2) to see the Indonesian version of the Marvel Comics Star Wars #1 cover! 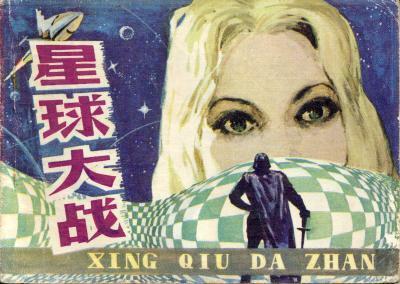 Another Chinese comic adaptation of Star Wars: A New Hope has been found. This adaptation follows the movie, but the only characters who look like their movie counterparts are C-3PO, R2-D2, and Darth Vader. This adaptation is notable because it contains the scene where Luke Skywalker meets his friend Biggs Darklighter on Tatooine. The Sandpeople Luke Skywalker confronts look like giant native African caricatures from a comic book from the 1940s or earlier. Chewbacca looks like an ape with suspenders holding up his pants! About 3/4 of the way through the comic they are just getting to the Death Star, and the pace of the book picks up rapidly with Princess Leia getting rescued, Obi-Wan Kenobi losing his battle with Darth Vader, our heroes escaping the Death Star, and the final space battle above the Death Star. The art is very psychedelic at points and the ending comes off like a drug induced dream. I am trying to figure out a way to show the pages of these Star Wars lianhuanhua without destroying the condition of the comics. My descriptions do not do these comics justice and some of this material needs to be seen to be believed. 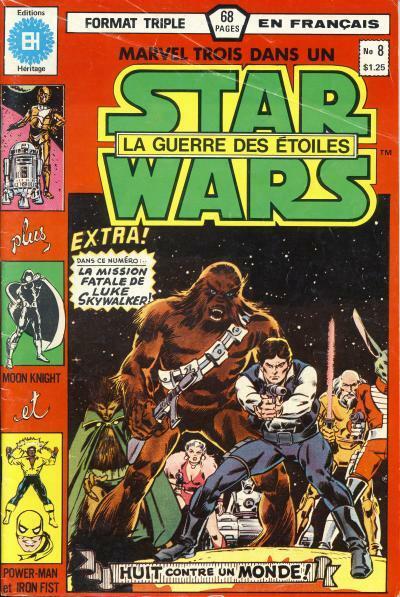 In 1981, les Editions Heritage started publishing Marvel Trois-Dans-Un X-Men for the French Canadian population which ran until 1985 for 26 issues. This comic, Marvel Three-In-One, features the X-Men, Defenders, and Nova. 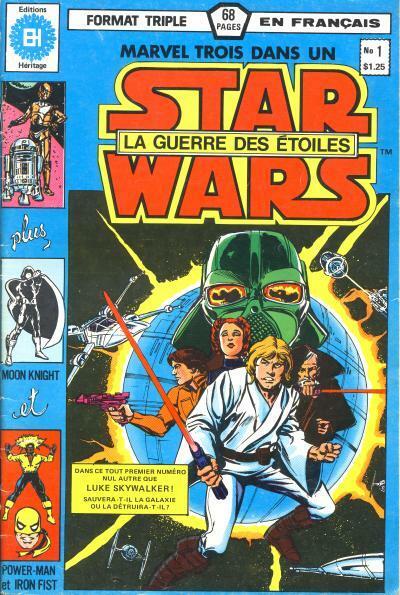 To coincide with the release of the Return of the Jedi, les Edition Heritage used the same format and released Marvel Trois-Dans-Un la Guerre des Etoiles in 1983. 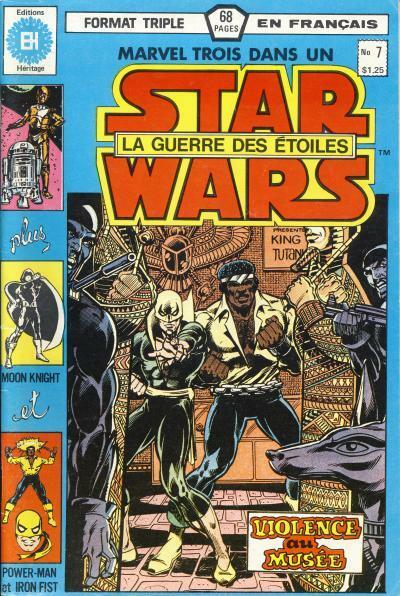 This comic featured Star Wars, Moon Knight, and Power Man & Iron Fist. The covers, except for issue #7, are the same as the U.S. Star Wars covers except they are framed. The three properties inside these issues are featured in the boxes down the left side of the comic cover. The only disappointing issue in the collection is issue #7 which features a Power Man & Iron Fist cover and not the cover to Star Wars #7, arguably one of the strongest covers in the original Marvel Comics run. In 1979, DC Comics released the first mini-series, World of Krypton. A mini-series is a title with a predetermined number of issues. Marvel quickly began experimenting with their own mini-series. 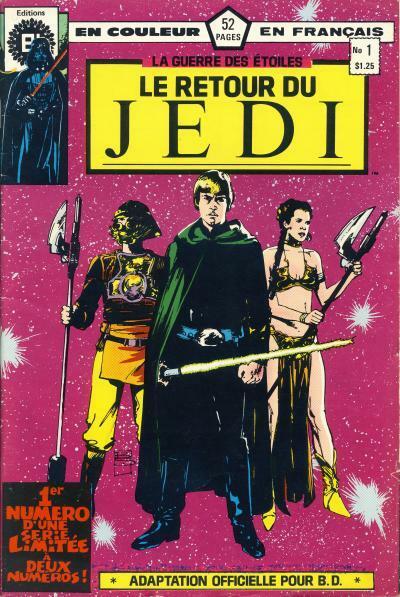 This new format allowed Marvel Comics to release 2 Star Wars titles from October 1983 through January 1984 when they decided to publish the Return of the Jedi movie adaptation as a 4 issue mini-series alongside the main Star Wars title. 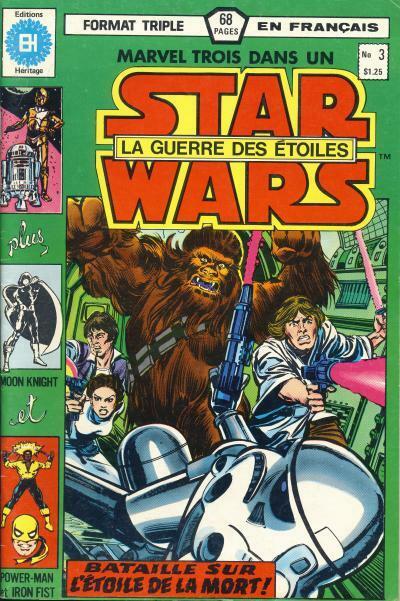 The roughly 1/5th of Canada's population that speaks French also received their own Return of the Jedi editions; les Editions Heritage combined 2 issues each of the U.S. edition into a 2 part mini-series. It feels like announcing additional Marvel Star Wars printings can be a second job at times. Marvel is going back to print for Star Wars #1, Darth Vader #1, and Star Wars #6. Star Wars #6 just came out this week and apparently the reveal of Han Solo's wife, Sana Solo, has sold out. Just as a reminder, her first appearance is in Star Wars #4. I'm surprised Marvel is printing more Star Wars and Darth Vader #1's so close to the release of the Director's Cuts. Star Wars #3 is going back to the press. On 07/01/2015, the 3rd printing of Star Wars #3 will be released. Even I admit, the reveal in Star Wars #6 was unexpected and definitely warrants the attention this issue will be getting. In Star Wars #6, the mysterious character from Star Wars #4 is revealed and ... it is Sana Solo, Han Solo's wife! You can read more about this reveal at "STAR WARS" COMIC EXPANDS UNIVERSE WITH MAJOR SURPRISE or Today's Star Wars Comic Changes The Canon... Forever! Big Han Solo Spoilers.